A Student's Book 'with answers' is also available, containing a comprehensive section of keys and recording scripts, making it suitable for self-study. 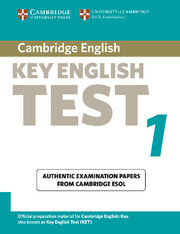 The Self-study Pack contains the Student's Book with Answers and the Audio CD. 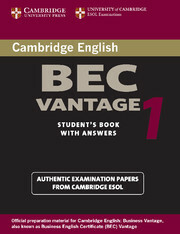  Contains authentic past papers from Cambridge ESOL, revised for the updated exam syllabus, introduced in March 2004.  Familiarises students thoroughly with the content and format of the KET examination.  Includes visual material to enable students to prepare thoroughly for the paired Speaking test (Paper 3).